On Sunday, it was the adults turn to get a behind the scenes look at the Royal Ontario Museum’s extensive Bird Collection. It was also the final class of the fall program. Just like the previous day with Jr. NS, Mark Peck was on hand to share his expertise on all matters relating to birds. The Peck family has an interesting connection with Robert Bateman going back to 1967. It was Mark’s aunt Alice, owner of the Alice Peck Gallery, who took a chance on a then unknown Mr. Bateman, and offered to hold a solo show of his work at the gallery. Bob had literally walked in off the street and asked if he could show paintings from his personal project to mark Canada’s centennial. All the paintings sold out on opening night. 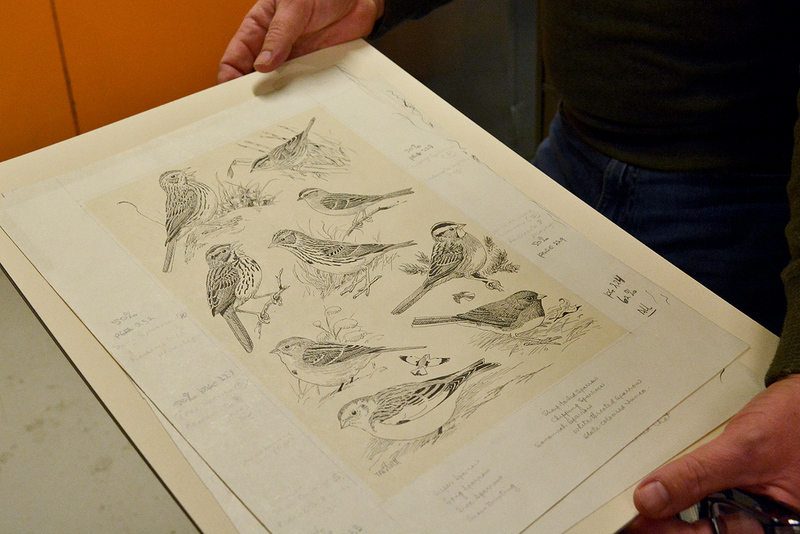 The tour of the bird rooms began with a story recounting the collection’s origin and an explanation about how these specimens aid present day scientists and researchers. We then moved through the narrow aisles as Mark opened up select cabinets and talked about the treasures stored within them. If all that wasn’t enough to inspire, the students got a close look at rare bird art by Major Allan Cyril Brooks (1869 - 1946) and Terence (Terry) Michael Shortt (1911 - 1986). The work of these two artists had a profound impact on a young Bob Bateman. After being overwhelmed by the enormity of the collection, we settled into the classroom and spent the latter part of the session sketching from mounted bird specimens. Outstanding work everyone, I’m sure Bateman would be proud! I hope that the experiences over these past 7 weeks encourage you to continue exploring the wild spaces around the city. I’m looking forward to seeing everyone again at the Student Art Show. Elf Owl, the smallest member of the owl family.